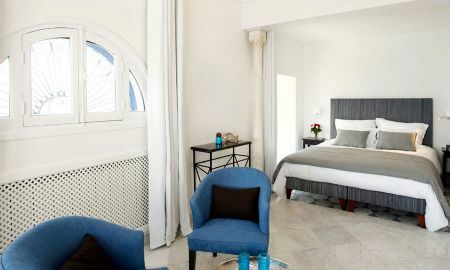 Villa Bleue is a charming 5-star hotel perched on the hill of Sidi Bou Saïd and overlooking the Gulf of Tunis. It offers a beautiful view over the sea. Boasting a great history, this big and traditional mansion perfectly combines Arabic and Andalusian architectures and creates a sense of balance between tradition and modernity. The 13 rooms and suites have different shapes, locations and furnishing, but all of them offer many amenities, a luxurious and intimate atmosphere as well as a beautiful view to ensure an exceptional stay. La Villa Bleue's rooftop restaurant invites you to discover its gourmet menu inspired by Jean-François Issautier, a French chef who has been awarded with two Michelin stars. You can taste many dishes prepared with vegetarian products, local seafood, spices and Tunisian dishes as well as contemporary specialities. The Villa Bleue hotel has two outdoor swimming pools including a heated pool, a gym and a wellness centre with relaxation room, massage room, steam bath and scrub area. Relax in this heaven of peace. Villa Bleue is located on a cliff overlooking the Gulf of Tunis and Carthage, in the picturesque village of Sidi Bou Saïd. Tunis Carthage Airport is 20 km away and the downtown of Tunis is 30 km from the hotel.